Tradelize is the ecosystem where ProTraders gain a unique trading toolset and investors achieve investment results equal to those of the best experts. Our goal is to lower the barriers of entry to crypto investment markets by providing tools that make crypto-trading opportunities accessible to professional and mainstream users. For Traders, we offer Tradelize.terminal, the first revolutionary DMA (Direct Market Access) standalone software solution for crypto trading with most innovative features from mature capital markets. Handcrafted with LOVE by traders for traders. For investors, we offer Tradelize.web, our one-of-a-kind environment where investors have the opportunity to follow strategies of the top rated professional traders using Tradelize.score, a unique database and a ranking system of 100% verified performance results. For beginners, Tradelize.app is a simple mobile app that can make any lay person a successful crypto investor with just a few taps. Paxtradings : How does the TDZ token function within the platform and why is it needed? Zapolskyi: TDZ Token will represent the internal mean of payment on the ecosystem (hereinafter, “TDZ”), the only accepted means for paying trading fees, commissions on copy trading and the only way to unlock and pay for additional services/products: i.e. historical data (backtesting tools, bot creation and trading strategies creation), use and support in development of automated trading strategies, co-location. TDZ tokens will be used as an access key. 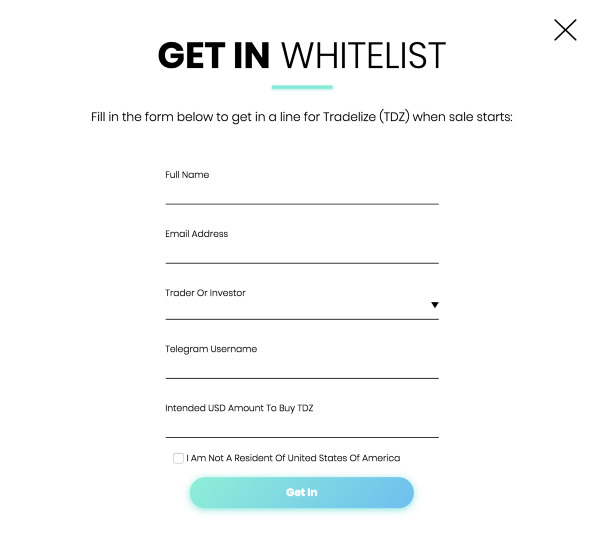 A holding of $100 worth of TDZ tokens gives traders access to Tradelize.terminal, and to investors — access to copying traders’ strategies. All prices for services will be denominated in fiat currencies, payable in TDZ tokens. Because service prices will be set in fiat, the actual market TDZ token value will be used to determine the number of tokens to be paid in fees for each transaction. Paxtradings: What is your strategy for growing the user base? What is the context of the industry as a whole and who is the target audience? – One proprietary trading company with over 200 ProTraders, who operate on NASDAQ, NYSE, CME. The third stage is to promote our ecosystem to miners and institutions to place their funds within our system, and to gain risk-free interest on funds provided for short selling and margin trading. Paxtradings: One of the main value propositions for traders is that they can easily exchange various tokens without having to use multiple exchange platforms. What coins will be supported by Tradelize post-ICO and in the future? Zapolskyi: By connecting all major crypto exchanges through API protocol, and acting as a broker for our users, we will be able to provide all currency cryptopairs for trading that are available on those exchanges. Paxtradings: What is your strategy for creating a network effect and attracting legitimate crypto traders that can be followed by investors? What are some of the key features that will bring these traders to your platform instead of others? Zapolskyi: To attain the network effect, we have a referral program, that allows every participant to earn 10% on all fees generated by invitees through the first year of their participation. 80% of funds raised through ICO will be allocated to the best traders according to our ranking system Tradelize.score. Traders will compete constantly to gain funds for management and to provide the best strategies to copy for investors. Also, an outstanding windows based trading terminal with direct access to all major crypto exchanges, and most features from mature capital markets, like full layout customization on multiple monitors, advanced orders: take profit order, stop loss order, trailing stop. Filters, sorting functions per price, liquidity, volume, etc, customizable news feed, advanced charting, arbitrage finder, and others. Paxtradings: What are some of the key features that the platform will offer for investors that strictly want to follow traders? Will users be able to set their own risk management parameters that differ from traders they choose to follow? Zapolskyi: Within Tradlize.web we offer investors a 100% verified extensive statistic per trader, such as historical profitability, risk appetite, max account drawdown, cryptocurrency allocation, and others. We will also offer risk management settings for investors to predetermine max drawdown for funds that will mimic trader’s activity, not withstanding traders own risk settings and recommendations to have the best outcome. Paxtradings: Arbitrage is a popular strategy in crypto trading. What tools will your platform provide to help traders find arbitrage opportunities? Are there any restrictions that exchanges will put in place to make arbing difficult? Zapolskyi: For that particular purpose, we have developed arbitrage finder, a tool that provides quotes for predefined crypto pairs from several crypto exchanges in a single window. Arbitrage opportunities, whenever they arise, are clearly seen and easy to capture in few clicks. Paxtradings: One of the value propositions for traders is the commission structure. What kind of commissions should traders and investors expect from using your platform? Zapolskyi: By transmitting all orders through our wallet on every particular exchange, we will be able to negotiate the most favorable fees for us, as every exchange has its own progressive scale of trade fees based on volume. In that way, we will be able to earn on margin between fees charged from us and fees that we will charge from our users, and even maintain that fees even lower than exchange would offer if participant executed their transactions directly. Paxtradings: How does your scoring system work for grading traders? Will investors be able to contact traders? Zapolskyi: Our scoring system will consist of numerous factors, which to date, cannot be fully disclosed, as that part is still in development stage. For now, we do not presume a chatting feature between traders and investors. Paxtradings: Regulations on cryptocurrencies and ICOs are big news these days. Are you planning to be regulated by any specific entities? How does Tradelize plan on supporting traders from countries with strict regulations on crypto trading? Zapolskyi: To date, we are closed for participation for residents of the U.S. However, we plan to have a custodian license. And to vigorously adapt our business model as the new regulation comes into force. Paxtradings: As a non-Tradelize question, we like to ask for unique predictions for the ICO and cryptocurrency space in the future. Where do you see both in the next 3–5 years? Zapolskyi: We think that ICOs will be highly regulated and it will be good for market health. Cryptocurrency will be expanding all over the world, and we will do our best to help it expands. Pre- ICO will begin on May 1, 2018 and will end on May 28, 2018. The main ICO will begin on May 29, 2018 and will end on June 30, 2018. A hard cap of $30,000,000 is set for this period. Current accepted currencies for Tradelize is Ether only. Tradelize is an ERC20 token, so it’s important that contributors use ERC20 compatible wallets to send funds to the ICO smart contract, and to receive the Tradelize tokens. Contributors will have their tokens distributed 2 weeks after the end of ICO. Visit the Tradelize website for more information and the contribution address. The number of issued tokens will be equal to the number of sold tokens plus bonuses. It will be known either when the hardcap is reached or when ICO ends, whichever one comes first. View the Tradelize website here.